Hawaiian Experience Spa is a family owned Hawaiian themed day spa in business since 2007. The Ibachs, who own the spas, are very passionate about Hawaii and bring a genuine Hawaiian vibe to the spas. 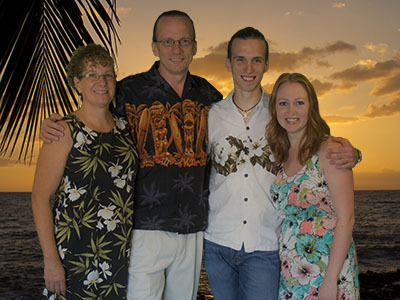 The founders Steve and Cathy Ibach both studied Hawaiian lomi lomi massage 0n Maui. Steve was a lomi lomi massage instructor and licensed massage therapist for 10 years. They decided to bring the unique style, and their passion for Hawaii, to their day spas in Scottsdale, Chandler and Goodyear. The other two spa owners are Mike Ibach (Steve and Cathy’s son) and his wife Nikki Ibach. Mike is president of the spas and is there on a day to day basis to ensure each client has a perfect experience. Nikki is a registered nurse as well as a licensed massage therapist. She is in charge of our esthetics department and ensures our facials are healthy and clinically effective. Each spa is at least 2,400 square feet and beams with a Hawaiian theme, from sand-colored furnishings and bamboo accents to a front desk modeled after a tiki bar, and includes massage rooms, facial rooms, exotic showers, steam rooms, infrared saunas, a complimentary tiki bar, and a lounge. All lotions and products used in the spa are organic or natural including our premier facial products by Eminence Organic Skin Care. The spas are guided by our spirit of aloha commitment shown below.